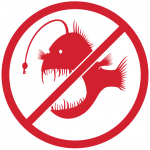 Phishing attempts – email messages sent by hackers pretending to be your friends, coworkers, or trusted companies – have wreaked havoc across the Internet for years. These messages try to lure you into revealing personal info like passwords and financial information, and their alarmist tone can be deceiving. Our Winter 2018 edition of the OIT Security Report is now available to the SMU community. 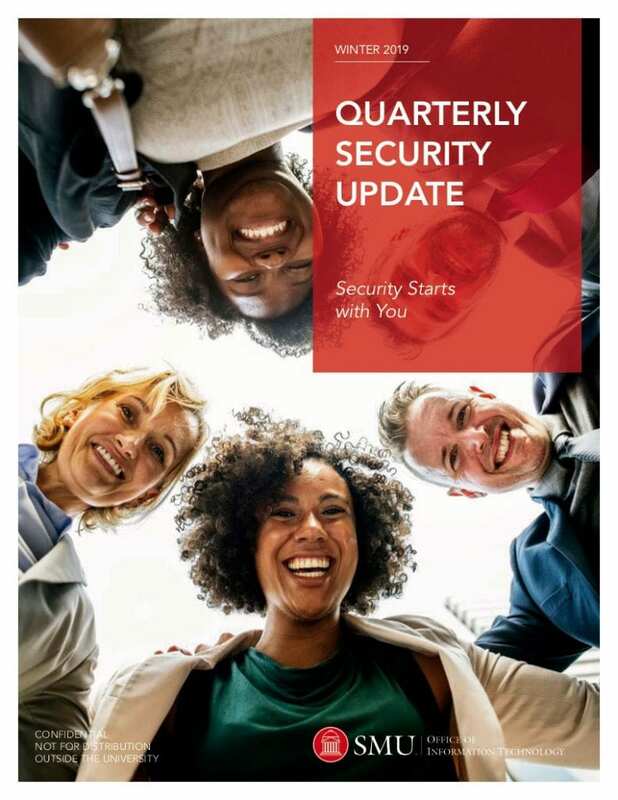 In this edition of the OIT Security Report is now available. In this edition, we show how a new phishing scam is using supervisor’s email addresses to request gift cards, we cover a data breach that exposed the personal information of up to 383 million people, and Ms. Security returns to discuss how an app is being sued for misleading consumers about data collection. As we begin the Spring semester, we would like to remind you to be diligent in watching for phishing emails. Over the last several weeks, OIT has been notified by a number of faculty and staff members who have received messages that appear to come from supervisors. The email will urgently request that the individual purchase a gift card (Walmart, iTunes, etc.). The emails have used an external email address like supervisors.name@gmail.com instead of their SMU email address. The phisher will request that the gift card numbers and pin need to be emailed or texted to the supervisor. These scammers do their research to get the name of the boss and details of his/her employees. Tracing their source is very difficult. Below is the sample email exchange in chronological order. Never comply with a request like this and always confirm either in person or with a phone call with the supervisor to make sure this is not a scam. In the example exchange below, Sally ABC is the chair of the Alternative History department of “univ.edu” and was spoofed by the bad guys. Dave XYZ is Sally ABC’s personal assistant. There is something I need you to do. Can you get this done ASAP? I need couple of Walmart gift cards (worth $100) for some a giveaway for a student club. Please get the physical card from the store. I need to send them out in less than an hour. When you get the cards, scratch out the back to reveal the card codes, and email me the codes. I am going into a meeting now with limited phone calls, so just reply my email. If you have any questions, please feel free to contact the IT Help Desk at 214.768.HELP (4357) or at help@smu.edu. 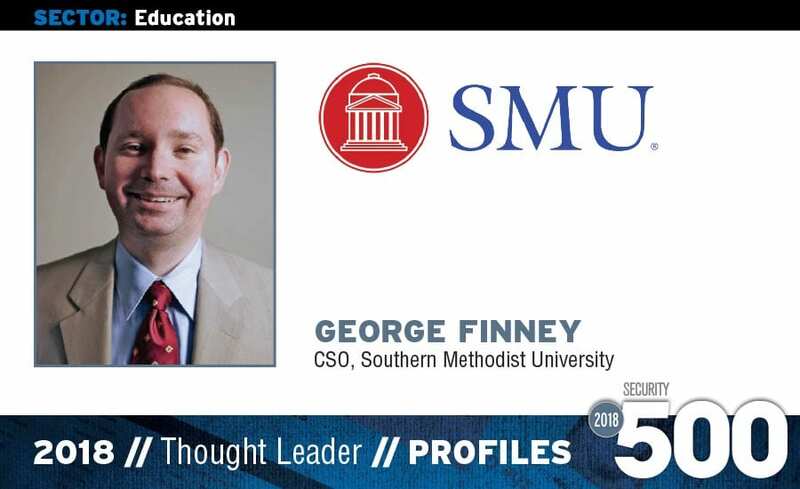 We are proud to announce that OIT’s own George Finney has been featured as one of Security Magazine’s Security 500 as a Thought Leader for 2018! George has worn many hats during his long career at SMU, and he has made great strides in revolutionizing cybersecurity practices during his time as Chief Security Officer. From modernizing physical security to the creation of a security operations center, George and his team have shown how important cybersecurity is to the success of SMU as a whole. In addition to his duties as CSO, George has also written a book on cybersecurity practices: No More Magic Wands: Transformative Cybersecurity Change for Everyone. The book details common cybersecurity issues in an informative, entertaining, and above-all actionable way. Congratulations to George on his achievement!